If you're into quiet, quaint cafés, Neutral Bay's Thelma and Louise is what you're looking for. It is undoubtedly one of Neutral Bay's best kept secrets. It’s the perfect stop on a summer morning. Drop in early for a hearty breakfast or stroll in late for a casual brunch. I ventured out there one weekday morning with a couple of my girlfriends to enjoy a delicious brunch by the bay. I ordered the eggs benedict ($18), which comes with a choice of salmon or ham. I had the salmon, which complimented the two eggs very nicely. 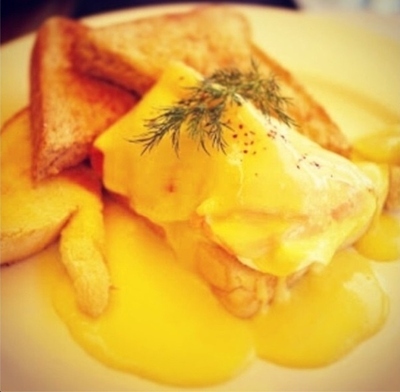 The eggs are laid upon a piece of toast, with extra on the side should you feel the need to dunk and dip into the luscious hollandaise sauce. This creamy dish is quite hearty, so it is most suited as a brunch meal. Though for my first taste of eggs benedict, it was delicious and I’d definitely go back for it. The proportions are generous and well worth the value; especially with the water views just outside. The famous berry and ricotta crepes ($17) are also quite popular, complemented with a passion fruit segment on top. If you’re in a rush and can only drop by, go for a magic monster muffin ($5). They definitely are monstrous in size, and the café generally have a different flavour each day. Stunning view from outside the restaurant, looking out onto Neutral Bay. It’s the perfect brunch spot. Bring along a newspaper, book or laptop, and just sit and enjoy. Of course you can’t leave without trying a cup of their coffee. If a cup ($3.80) is too small, you can ask for a mug ($5), bowl ($7) or even a jug ($10). Very nice. If you’re not a coffee lover, go for the khali hot chocolate or a latte ($5.50). Delicious. It’s a small café tucked away on the outskirts of the city, best enjoyed for a peaceful and picturesque meal with your family or friends. On a weekday it’s quiet and serene, and opens from 7am to 5pm, although still popular. Weekends have a slightly later start at 8am, but it can get crowded - therefore it’s best to book ahead of time. There too is limited seating outside on the deck, so get there early, although the view of the bay is excellent both inside and out. It’s an easy walk from North Sydney, taking you no more than twenty minutes through the back streets. But if you’re up for some fun, or what one might call a voyage; have a go at catching the ferry which runs every thirty minutes from Circular Quay wharf, anchoring directly at the café's door. The kids will love it. It definitely is a kid friendly café, with a colourful interior and quirky ornaments hanging from one end of the cafe to another. They’re bound to get excited. Although it is quite small, and therefore there isn't a whole host of room for strollers. They're best left outside. In addition the staff are extremely pleasant and helpful. A great experience. Why: Great food and service.